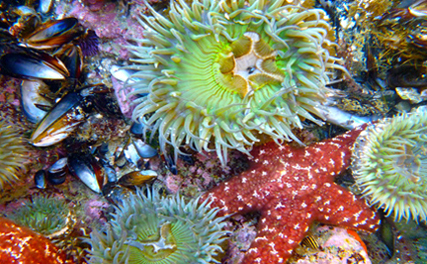 A few of the interesting creatures you can observe at one of the Central Coast’s tide pool areas. Blend into the natural world around you. The best way to get the most of your experience is by remembering that you are a visitor to these animals’ natural habitat and home. Moving slowly and being patient will ensure that you do not disturb the natural life along the beach. When you blend in, your adventures instantly become more authentic to the natural way of life by the tides. By slowing down, you will also learn more, and see more, of what is going on all around you. Try this out at Montana De Oro State Park, a secluded and sprawling public park that is a haven for all kinds of species. The rocky shorelines at Corallina Cove and Hazard Reef make for plentiful tide pools, and you can see creatures like crabs, starfish, shells and more. To get the most out of your experience, remember to respect the actual life on the rocks. Many animals make the rock their home and are connected to it, so be careful to walk only where you can see bare rock. Remember that seaweed is slippery, so be careful and move slowly around the tide pools. As far as touching the animals, the National Park Service says that many tide pool animals can be touched, but it’s important to remember to be very gentle so as not to disturb or harm them. For max tide-exploration, be sure you get there at the right time! There’s nothing more disappointing that gearing up to see the tide pools, only to discover that the tide is up to the cliffs. 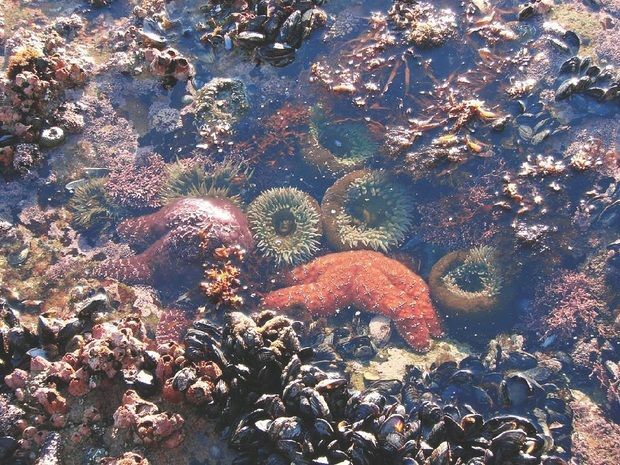 The best time to explore tide pools is during low tide, especially when the tide is under two feet. Click the links for information on Pismo Beach tides, Cayucos tides, and Montana de Oro tides, and plan accordingly. Don’t limit your exploration to just the pools, but be sure to look around onto the sand and limitless ocean.You’ll also see more of the life besides the tide-pools, like birds and other creatures that make the beach their home. Especially in Pismo Beach in winter and spring, you might see wildlife like whales, seals, dolphins, and more, casually swishing through the blue waters. 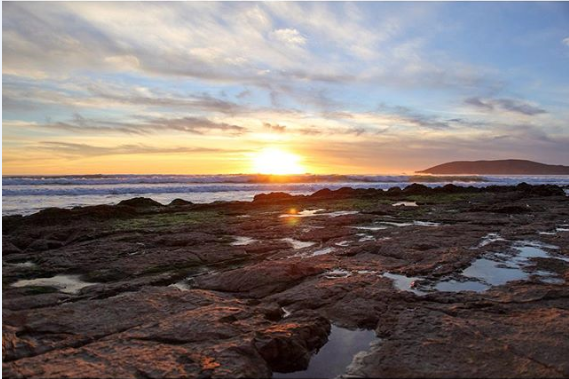 Try visiting the beautiful shoreline below Margo Dodd Park, just a short walk away from our Pismo Beach hotels: Inn at the Cove, Shore Cliff Lodge, and Pismo Lighthouse Suites. Bring a pair of binoculars and set aside a little time to sit and enjoy the coastal environment. Thank you so much for reading! Our beachfront hotels offer a premier environment to explore and learn more about the natural world around us. Visit our main website for more information about our hotels and tourism on the Central Coast.